How to Sign Documents with Google Docs, Drive, Gmail and Sheets? Would you like to sign documents (pdf, doc, docx, Google Docs etc.) paperless right out of your Gmail account? Or sign and send a SignRequest directly from Google Drive, Google Docs or Google Sheets? Now that’s possible with SignRequest! 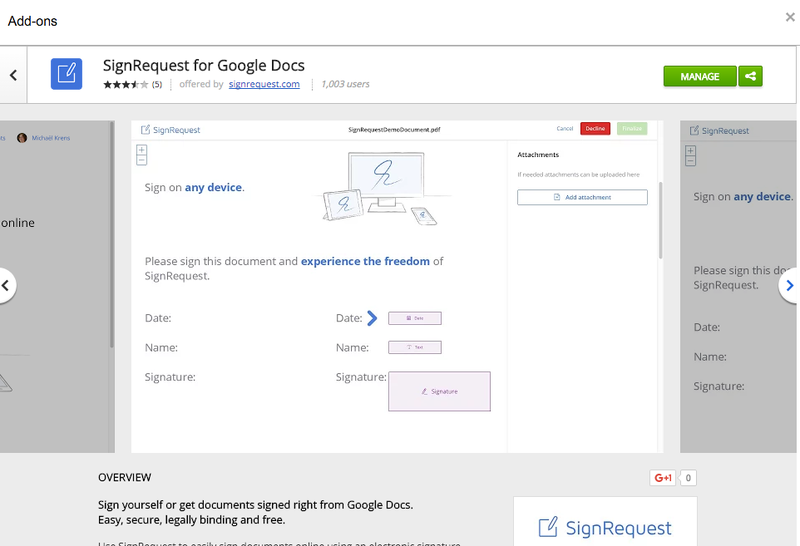 If you use Google Docs (a free application similar to Microsoft Word) you can now electronically sign and/or send a SignRequest directly from the Google Docs document. Visit the Google Docs Add-on store and install our electronic (digital) signature extension in just a few seconds. With the SignRequest for Gmail plug-in you can sign a (PDF, Doc, Docx, Sheets etc.) attachment directly from within Gmail and automatically send a copy of the signed document to the sender of the attachment. The signed documents are automatically stored in your SignRequest account and optionally also in your Google Drive account. Get the free SignRequest electronic signature for Gmail plug-in the G Suite Marketplace. 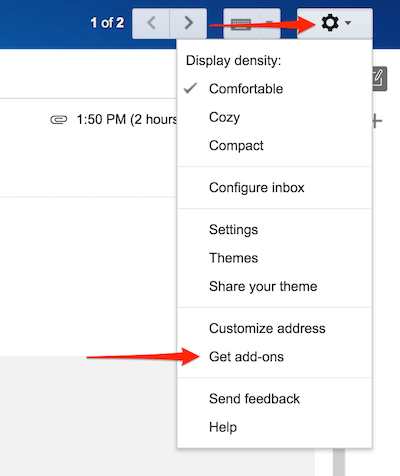 You can also select 'Get add-ons' within your Gmail account and search for SignRequest. Click on the SignRequest icon to open the side window. To automatically send a copy back select 'Sender as Copy only'. You will now be directed to SignRequest and can sign the document the usual way within SignRequest. After you have signed, you and your contact will both receive a signed copy of the document in your email. If you’re a registered user the document will also be visible in your documents overview and you'll be able to easily use your signature again. After installing the SignRequest Google Drive App your contracts are automatically stored on your Google Drive. 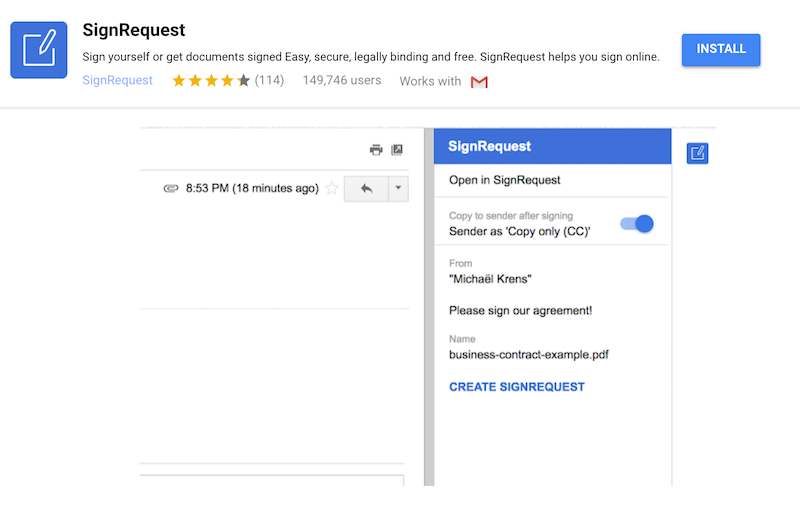 In addition, you can sign and send a SignRequest directly from your Google Drive by choosing “Open with SignRequest”. You can install the Google Drive App here. 4. How to sign Google Sheets? 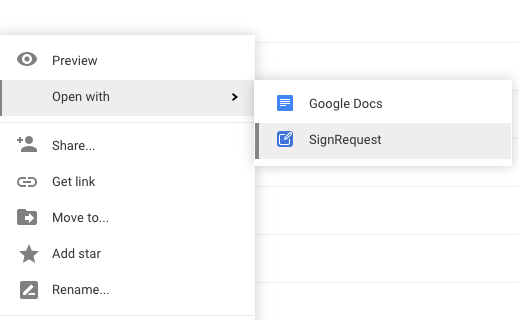 After installing the Google Drive extension you can also open a Google Sheet with SignRequest. It's however important to test the format of the sheet to make sure you have a proper result after SignRequest's conversion process. 5. How to electronically sign a Google Form? 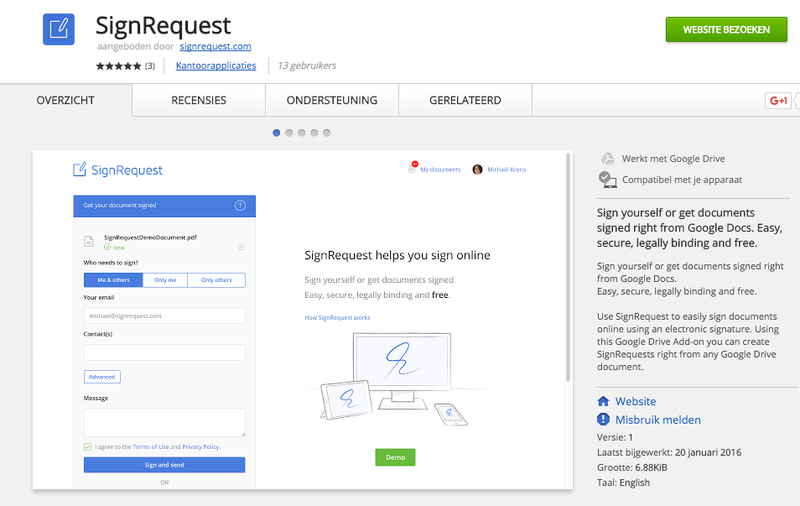 Unfortunately SignRequest does not yet work directly with a Google Form. Google for now does not allow it. There is however an option by using a service that generates a pdf from a Google Form and connect this app to SignRequest with Zapier. If you have a standard template you can also prefill the input of the Form into the template and get that signed. This is not a direct integration like the ones above, but might be worth the effort depending on your use case.